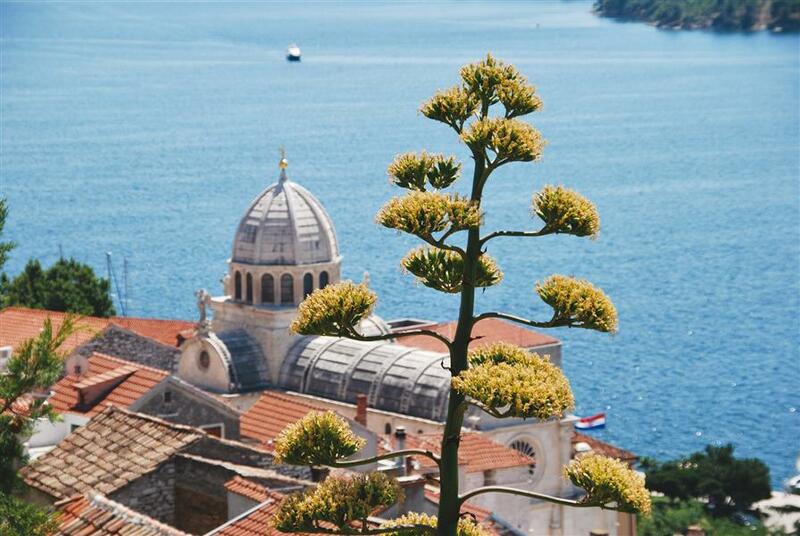 We are presenting a selection of 10 Top Incentive ideas in Šibenik which span from waters, to land, and all the way to historic and cultural monuments and traditions. Dalmatian Ethno Village set in the very heart of Amadria Park, offers visitors a glimpse into the special charm of ancient times through typical Dalmatian village life from the past. The program includes traditional delicacies prepared according to original recipes, a visit to Amadria Park‘s own vineyard, olive park, oil mill and distillery of olive oil, a visit to the wine cellar, eco garden and to the weaving workshop which offers an opportunity to make an own souvenir using the traditional method of weaving on a loom. Just a few kilometers northeast of Šibenik, the Croatia’s Krka National Park, covering more than 100 square kilometers around Krka river and its numerous lakes and waterfalls, is located. The visits to Krka NP combine walking trails, stunning viewpoints, spectacular visits and view of historic cultural monuments. The visit can be done in a form of hiking and/or cycling, and even by a boat excursion that offers stunning views of several waterfalls. Kornati Archipelago, one of the most beautiful archipelagos in the world, is a unique cluster of 150 islands, islets and cliffs in northern Dalmatia. A boat excursion to Kornati National Park offers an excellent experience of the extremely clear sea, different beaches and hidden corners. The boat trip includes lunch, time for swimming, and walks onto the island peaks. Klapa multipart singing, an ancient tradition of the Southern Croatian regions of Dalmatia, has since 2012 been inscribed on the UNESCO’s Representative List of Intangible Cultural Heritage of Humanity. Šibenik offers a special incentive Klapa singing workshop called ‘Sounds of Dalmatia’ which combines the experience of sighsteeing and singing: guidance through the most iconic part of Šibenik’s old town with stops to learn and sing Klapa songs with professional Klapa mentor. A great way to spend a short break in Šibenik is to take a stroll through the streets of its medieval old town and photograph it. However, not just ordinary amateur photography, but professional photography which participants can learn on a guided Šibenik photo tour. What makes this tour special are the two guides at visitors’ disposal; a tour guide who knows all the treasures and secrets of beautiful Šibenik, and a photo guide who is a professional photographer. To explore Šibenik’s rich history and stunning naturial beauties, incentive programme Dalmatian Historical Time Machine offers an adventorous jeep ride. Driving along Dalmatian roads, the Jeep Safari stops by: the royal town of Knin; Krčić waterfall in the National Park Krka; the 9th century St.Salvation Church and a visit to its 1100 old tombs; at the Cetina river spree with authentic Dalmatian lunch in the authentic stone house in the olive grove. The trip finishes with a stop on a gorgeous viewpoint overlooking the Visovac island. The best way to explore the charms of famous Šibenik’s sea side is offered by an incentive called »Hidden Šibenik – Kayaking«. The kayaking tour along Šibenik’s secrets and historical diamonds includes picnic in nature, professional guidance by a licensed guide that leads participants through the St.Anthony’s Channel to the St.Nicholas Fortress and waters. The added value of the incentive is in its hidden spots to which the experienced local guide takes. Cruising down the mouth of Krka river takes through the beautiful St Anthony Channel, by well-known landmarks like the Venetian fortress of St Nicholas and an ex-military sea tunnel known as “Hitler’s eyes”. Further north, spectacular view of Šibenik and landscape of Krka are offered. While the arriving to Skradin fascinates with beauty and history of National Park Krka. The ECO Friendly Tour includes a visit to Falconry Centre, Horse Farm and Agritourism. It offers an unforgettable experience for everyone wanting to feel a breeze of wilderness and adventure by getting to know the mysterious life of sky hunters – falcons. At a Horse Farm guests can continue enjoying the nature far away from the city heat and try horse riding on. At the end guests get served domestic food ain a relaxed ambiance of the traditional Croatian household. Once a powerful guardians of the city, now breathtaking giants that capture with their beauty, architecture and views overlooking the city panorama. Four Šibenik fortresses still fascinate the visitors with the same intensity and two of them were a movie locations in HBO series Game of Thrones! Tour includes all Šibenik fotresses, fascinating viewpoints, professional leadership – storytelling by a licensed guide, historical stories – fun and easy way to learn facts, easy trekking, and best photo-op moments.